Our new Fast Facts uses data from Library Jobline to evaluate Colorado’s library job climate. In 2012, almost 400 library jobs were posted to Library Jobline, thus marking the third year in a row in which there was an increase in the number of jobs posted. Although there appear to be more opportunities for library-related employment, the starting wages for library jobs posted to Library Jobline have changed little since 2008. Fortunately for job seekers, there was also little change regarding the number of postings that specified requirements or preferences for certain types of experience (e.g., library experience, supervisory experience) or skills (e.g., Spanish fluency). details about the project’s workforce efforts, partnerships, and statewide initiatives that have focused on addressing critical workforce development issues in Colorado’s rural areas. Visit CSL’s BTOP website to learn more about the project. A recent LRS Fast Facts used statistics from LibraryJobline.org, an online service for job seekers and employers hosted by LRS, to assess the state of Colorado’s library job market in 2011 as compared to previous years. The report showed that after bottoming out in 2009, Colorado has seen a slow but steady increase in the number of library jobs posted per year. Additionally, interest in those positions, as evidenced by the number of views per job, has dropped off. While starting salaries have increased slightly for positions that did not explicitly require an MLIS, the starting salary for positions which did mandate an MLIS were stagnant. Data from LibraryJobline.org from the first quarter of 2012 suggests good news for those seeking library jobs in Colorado. On average, there have been 33 new jobs posted per month, as compared to 26 jobs per month in 2011—an increase of 27 percent. 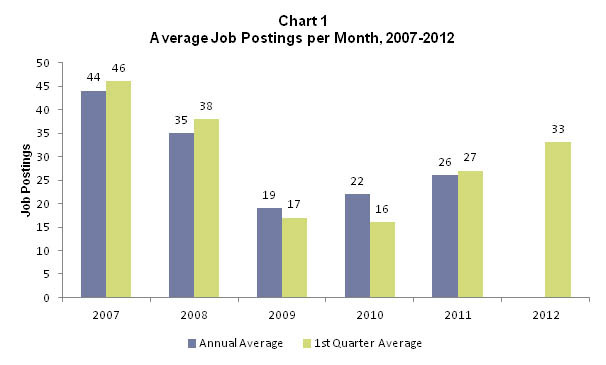 In contrast to the first quarter of 2011 alone, in which an average of 27 jobs per month were posted, 22 percent more jobs were posted in the first quarter of 2012 (Chart 1). New jobs posted from January to April of 2012 were viewed an average of 761 times each, a decrease from 1,951 views per posting in all of 2011. This decrease could signify a less competitive job market, although it could be attributed to other reasons, such as the rise in the number of Library Jobline users who receive news about available positions via email, RSS feed, or Twitter. 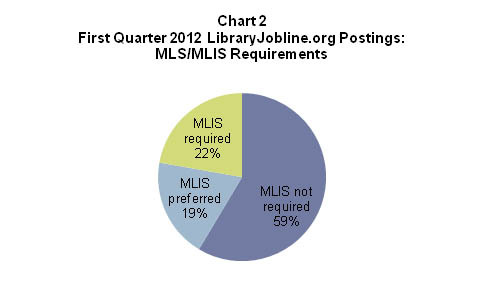 Only 22 percent of first-quarter 2012 LibraryJobline.org postings required an MLS or MLIS degree, as compared with 33 percent in all of 2011. Nineteen percent would give preference to candidates with an MLS or MLIS, and 59 percent of all first quarter 2012 postings did not specify any such preference or requirement (Chart 2). Of 147 jobs that were open (not posted) in the first quarter of 2012, 17 (12%) did not list starting salaries. With those exceptions, the average starting salary for positions that did not require or prefer an MLIS was $19 per hour, or $2 more than the average starting salary for similar positions in 2011. The starting salary for positions that preferred an MLS/MLIS dipped by $2 however, from $21 to $19 per hour. Starting salaries for positions that required an MLS/MLIS rose slightly, from an average of $24 per hour to $24.25. Data from the first quarter of 2012 does not conclusively show changes, either for the better or worse, to the library job market in Colorado. However, this information does help job seekers and employers to stay abreast of library hiring trends. Are you an employer or job seeker? Set up a customized account at LibraryJobline.org, and follow Library Jobline on Twitter: @LibraryJobline. Data pulled from Library Jobline, the online matchmaking tool for library job seekers and employers maintained by LRS, shows that in 2011, Colorado’s library job market continued to improve for the second consecutive year since the most recent recession. The average number of jobs posted per month and annually rose from previous years, and starting salaries increased for positions which did not require an MLIS degree. In addition to examining 2011 data from Library Jobline, this Fast Facts also looks at national trends, using information from the Bureau of Labor Statistics, the American Library Association, and Library Journal. Click here to read the Fast Facts report in its entirety. Also, an update to this information, discussing Library Jobline data from the first quarter of 2012, can be found here. Our new Fast Facts discusses recent trends in public school librarian staffing and student enrollment. Based on an analysis of National Center for Education Statistics data, public school librarian staffing numbers remained relatively stable from 2004-05 (the first year this data was reported) to 2007-08. However, these positions nationwide declined by 8 percent from 2007-08 to 2010-11, while the total number of students increased by 2 percent. In Colorado, this gap was more pronounced: school librarian positions fell by 9 percent during this time period, while the total number of students rose by 5 percent. Our new Fast Facts, “ALA-MLS Librarian Staffing in Colorado and U.S. Public Libraries,” will pique the interest of anyone who has wondered about the distribution of librarians to ALA-MLS-accredited librarians, or about the proportions of librarians to other staff, in Colorado or the U.S. at large. Based on an analysis of Colorado and national public library staffing data, we found that in spite of the recent recession, these ratios have remained relatively stable over time, and that Colorado is keeping pace with national trends. The Fast Facts is available here. Forbes.com recently posted an article on “The Best And Worst Master’s Degrees For Jobs,” and a Master’s in Library and Information Science was ranked the No. 1 worst degree. These rankings were based on mid-career median pay and estimated rate of growth of careers in 35 popular degrees. The results of our 60-second poll “The Value of an MLIS to You,” however, show a different picture of the degree’s worth, one beyond monetary potential. Those who completed the survey were certainly concerned about the job market and salaries, but our respondents also left lengthy comments about the intrinsic rewards of the profession, and 79% agreed that the degree was worth the time and money invested. Read the full report with analysis of the comments here, or see the highlights in our Fast Facts report. Edited to add: ALA President Maureen Sullivan has a nice response to the Forbes article in the Washington Post. The results reported in this article represent the first part of a larger study we are conducting to look at the relationship between school librarian staffing and achievement scores. Our next step is to do a more in-depth analysis of Colorado schools, where we have access to staffing and achievement test data at the building level (the data used for our SLJ article were at the state level). Look for a report of the results in the coming months. We encourage others to pursue this type of research in their state/region.